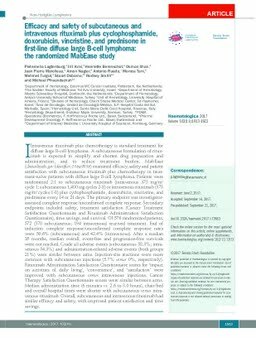 I Intravenous rituximab plus chemotherapy is standard treatment for diffuse large B-cell lymphoma. A subcutaneous formulation of rituximab is expected to simplify and shorten drug preparation and administration, and to reduce treatment burden. MabEase (clinicaltrials.gov Identifier: 01649856) examined efficacy, safety and patient satisfaction with subcutaneous rituximab plus chemotherapy in treatment- naïve patients with diffuse large B-cell lymphoma. Patients were randomized 2:1 to subcutaneous rituximab (intravenous 375 mg/m2 cycle 1; subcutaneous 1,400 mg cycles 2-8) or intravenous rituximab (375 mg/m2 cycles 1-8) plus cyclophosphamide, doxorubicin, vincristine, and prednisone every 14 or 21 days. The primary endpoint was investigatorassessed complete response/unconfirmed complete response. Secondary endpoints included safety, treatment satisfaction (Cancer Treatment Satisfaction Questionnaire and Rituximab Administration Satisfaction Questionnaire), time savings, and survival. Of 576 randomized patients, 572 (378 subcutaneous; 194 intravenous) received treatment. End of induction complete response/unconfirmed complete response rates were 50.6% (subcutaneous) and 42.4% (intravenous). After a median 35 months, median overall, event-free and progression-free survivals were not reached. Grade ≥3 adverse events (subcutaneous 58.3%; intravenous 54.3%) and administration-related adverse events (both groups 21%) were similar between arms. Injection-site reactions were more common with subcutaneous injections (5.7% versus 0%, respectively). Rituximab Administration Satisfaction Questionnaire scores for ‘impact on activities of daily living’, ‘convenience’, and ‘satisfaction’ were improved with subcutaneous versus intravenous injections; Cancer Therapy Satisfaction Questionnaire scores were similar between arms. Median administration time (6 minutes vs. 2.6 to 3.0 hours), chair/bed and overall hospital times were shorter with subcutaneous versus intravenous rituximab. Overall, subcutaneous and intravenous rituximab had similar efficacy and safety, with improved patient satisfaction and time savings.